A while back I mentioned that there is one surefire way to know if I love a book- if I immediately seek out all the other books that the author has written. Today I found another way to tell that I love a book- if I force the next mom that I encounter to take the book home and read it immediately! I finished reading Totally Desperate Mom last night and this morning when a friend (and fellow person with kids who are WAY too close in age for parental sanity) dropped by, I made her put it in her bag and take home to read. 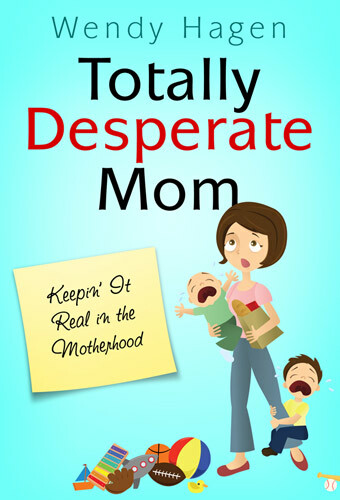 Starting from the delusion-filled journey into motherhood and progressing through the various stages that take place in the preschool years, Totally Desperate Mom is a no-holds-barred, comical look at motherhood from a mom in the trenches. Wendy offers biblical encouragement and practical tips for taking care of mom emotionally, physically, spiritually and in the marriage. I was finishing up this book last night in bed and kept waking my husband up- either to read him passages from the book that really resounded with me, or with my laughter over the funny parts. The book discusses pregnancy, labor and delivery, breastfeeding and all the joys and challenges that go along with those things. Then it has chapters dealing with different ages of kids- I could particularly relate to the "terrible threes" chapter, as my son has decided to arrive in that fun stage a few weeks before his third birthday. My favorite part of the book was definitely part III, which deals with "mental breakdown days" and taking care of mom emotionally, physically, and spiritually, as well as taking care of marriage. It was all very encouraging reading. If you're the mom of small kids or if you know someone who is, and you could use a laugh and a bit of a reminder that you are not alone, please pick up Wendy's book. It's available on her website. Good news for you guys- Wendy graciously sent me an extra signed copy to give to one of you! US mailing addresses only, please. Just let me know why you need to read this book, or who in your life could really use it the most! 2. Put my button up on your blog and let me know where to find it! Can be done daily, please leave me a separate comment with link to your tweet each time. 4. Enter any of my other currently ongoing giveaways. 5. Subscribe to my blog via email. Sign-up on the right side of this page. 6. Follow Wendy on twitter! Giveaway will close at 9 PM Pacific time on July 29, 2010. I'll chose a winner with random.org and will email that person who will have 48 hours to respond. Good luck! Disclosure: I received a copy of this book to review and one to offer as a giveaway. I was not compensated in any other way and all opinions posted here are mine and mine alone. I only have one little girl right now but I already have my "desperate mom moments"! I would love to read this book and then pass it on to some of the other moms in my "homemakers" group at church! mY SISter could use this!! I follow you on twitter and tweet! I could use this book. And I'd pass it along to my cousin when I was done. We were both just talking about successes and failures in motherhood this morning. I have three kids - 7, 4, and 2. Her kids are the same ages + she's expecting soon. WE'd love to read Wendy's book! I'd love to read this. As a mom of kids aged 5, 3 1/2, 2 1/2, and 13 months- I"m sure I can relate, laugh, and learn so much from it! My sister in law could use it! They just had baby #2! I follow you on Google.. I love to read just about anything...and I'm a mom so I'd like to win this! I would love to read this book because just 20minutes a day of alone time reading a book would be great!